Cristiano Ronaldo didn't have his most efficient game in front of the goal but nevertheless finished the weekend one further goal ahead of Lionel Messi. Ronaldo missed a penalty and failed to hit the target with four of his nine shots but did find the net once in Real Madrid's 4-0 win over Sevilla. Messi, meanwhile, got just one of four shots on goal as Barcelona were forced to settle for a 2-2 draw at Villarreal. Cristiano Ronaldo has scored nine goals in his last seven league games. Rob Train on Ronaldo: 7/10 -- A nice run and shot on goal in the first half drew a good save from Sergio Rico, but this was a bit of a slumped-shoulders-and-arms-in-the-air performance from the Portuguese, who missed a penalty in the second half, blazing high over the bar. Ronaldo then hit the net from point-blank range from Danilo's cross and tested Rico a couple of times, also setting up a few chances for his teammates. But in a game in which Real peppered the Sevilla goal with 26 attempts, Ronaldo will have expected more. Lee Roden on Messi: 8/10 -- Pulled off some spectacular passes in the first half, changing the direction of play effortlessly and putting the ball in dangerous areas for Luis Suarez and Neymar. His delivery from a free kick helped to create Ivan Rakitic's opener, and Messi's wonderfully weighted through-ball also led to Barca's second goal. He adopted a wider position after the break and, while not as influential, some of his turns of pace were very effective. Lionel Messi failed to score for the first time in five league games. After the international break, it's Clasico time! 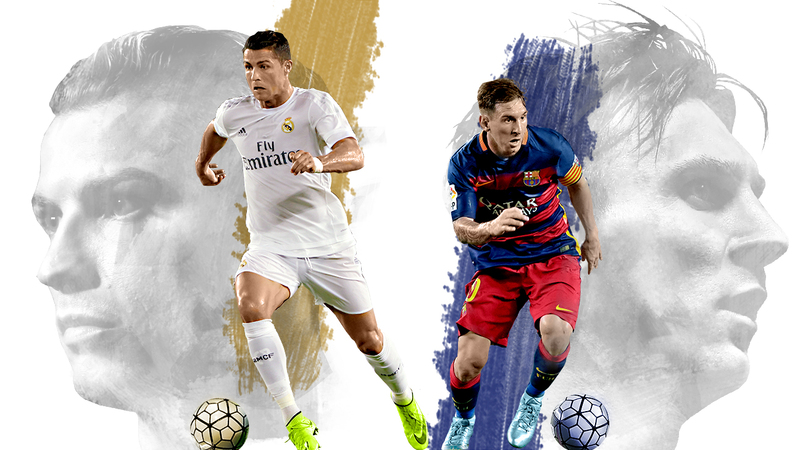 Messi and Ronaldo go head-to-head when Barcelona host Real Madrid on April 2. "These projections account for the historical performance (goals scored and minutes played) of the two players since 2010, strength of opposing defences faced (measured by SPI defensive rating), game location, and the potential for injury or missing games. Based on these inputs, the predictor will estimate the chance of each player scoring any number of goals for each remaining game. From this, we can project the total number of goals scored, hat tricks, and the chance of each player accruing more goals than the other over the course of the entire Liga season."